NYC Birth Village: Thank you for joining us for this interview! We’re grateful to have you on our blog today. What made you decide to seek postpartum doula care and subsequently choose NYC Birth Village for your doula? 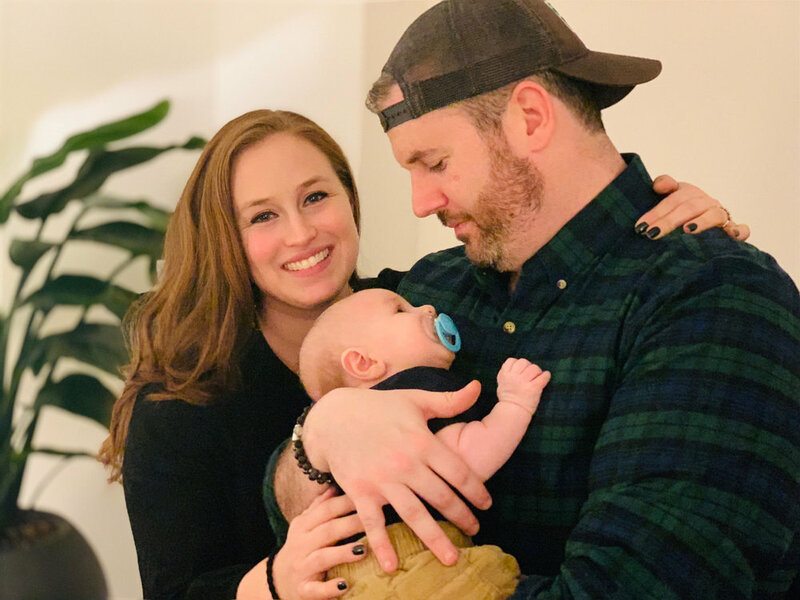 Kerry and Jesse: We were fortunate enough to have multiple friends share their extremely positive experiences with NYC Birth Village. Prior to their recommendations, we had never even considered doula care and truthfully, didn't know much about it. So, my husband and I began researching postpartum doula care. We decided to test the waters with a birth and labor prep class and infant care class. We enjoyed our experience so much that we knew postpartum care would be very beneficial for our family. This was our first baby and we don't have any family nearby, so I knew we would need help and support. I also wanted someone that I could trust, feel comfortable with and open up to. After meeting Brianna, I knew we were in good hands. NYC BV: In what ways did Brianna help you prepare prior to your baby’s arrival? K&J: I'm not sure I can actually list all of the ways! From an educational standpoint, she spent several hours with us reviewing infant care and breastfeeding principles, both of which were completely new to my husband and me. As I mentioned, this is our first baby and we are the first in each of our families' to have children. We were nervous that we wouldn't have enough knowledge to care for our new baby but Brianna put us right at ease, shared information in a manner which was easy to absorb and helped us feel confident and prepared. However, Brianna's help went beyond educational; she offered us emotional support, as well. I had a C section, so was very nervous about our birth. She provided me with a safe space to voice my concerns and anxieties without judgement. NYC BV: What do you remember and appreciate most about your postpartum support? K&J: This is a tough one! I had a particularly challenging birth due to some complications during and after my C-section. I expected the first few weeks home with baby to be hard, but truthfully, there is no way to really prepare for how difficult it is. It is beautiful and wonderful, too. But, you are challenged in completely new ways as a person - emotionally and physically and all on little to no sleep! Having Brianna in my corner was such a relief. What I appreciate most about my postpartum care is knowing that I could depend on my doula to be there for me during a time when I didn't realize how much I needed it. I am not great at asking for help, but Brianna just seemed to know what I needed before I even asked. She asked me important questions and provided me a safe, supportive space in which to share my questions, experiences and feelings, as well as provide me with answers to the overwhelming number of questions I had as a first time parent. NYC BV: What would you suggest to someone who is on the fence about hiring a doula for postpartum support? K&J: I think it is the best decision you can make for yourself and your family! However, do your research to decide what services will be most beneficial for you and you can also ask to meet with a doula before deciding to hire him or her to make sure that you find the right person for you. If you are interested in finding out more about and/or hiring one of our postpartum doulas, please visit our website. We look forward to hearing from you soon! This week we are highlighting one of our collaborators, Fiona Pippa. Fiona is an NYC-based massage therapist who works with all kinds of people, but also specializes in prenatal and postpartum massage. Read her interview below. NYC Birth Village: Tell us a little about yourself and how you got into Massage Therapy? Fiona: I have been working with my hands since childhood. I work as a sculptor, painter and as a passionate gardener. While growing up in Ecuador, I became knowledgeable about plant medicine, body work and shamanic practices. Massage therapy felt like a natural progression for me. Shortly after having my second child I enrolled in the Swedish institute of New York City to become a fully licensed massage therapist. NYC BV: What are some ways that an expectant parent can benefit from Massage Therapy? F: Massage therapy can have a subtle, yet powerful, impact on an expectant parent. It can reduce stress, alleviate pain and increase a sense of wellbeing. The most noticeable side effect of massage is relaxation, and in pregnancy this can be a key component of a healthy outcome. NYC BV: What are some ways that the postpartum person can benefit from Massage Therapy? F: The postpartum person can experience a range of side effects associated with natural birth, c-sections, breastfeeding and handling baby. Massage therapy can offer many benefits, such as alleviating localized and overall muscular pain, reduce edema (which is a common side effect of c-sections), and balance moods by encouraging the production of “feel good” hormones in the brain. NYC BV: Is there anything else that you'd like for us to know about you or your services? F: I am an experienced therapist with strong knowledge of different massage modalities, and I customize my sessions specifically to the needs of my client. I see clients at my Yorkville studio, I visit them in the comfort of their home or in their hospital room. If you are interested in finding out more about Fiona or signing up for her services, visit the NYC Birth Village Doulas Contact Page! “Babywearing may be as old as the human species, but modern science is now revealing some incredible benefits that were previously unknown. Were you aware that mothers who carry their young become more responsive to their needs? Or that it promotes attachment between infant and mother? How about the fact that slingin’ your bubba reduces the risk that they suffer from reflux, “flat-head”, or otitis media (inner ear infection)? If you’re interested in learning more about Babywearing, our doulas at NYC Birth Village can tell you all about it!